Try outs are held each April or May. Our competitive season runs June through May of the next year. 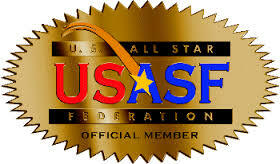 Gym of Dreams is an official member of the United States All Star Federation. Coach Duane is credentialed in Levels 1-5 as well as tumbling. He is also on staff with USASF as an instructor. Come join us! One team...one family!